The Bishop Grosseteste stall was particularly interesting because it had displays of genuine archaeological finds including Roman tiles and coins, as well as finds from medieval and Victorian times and some replicas of attractive medieval brooches. The college offers degrees in heritage studies and MAs in heritage education and community archaeology, and some related short courses. The Churches Conservation Trust is an English charity focused on preserving churches, and it runs various events. In order to keep churches in good repair they try to restore the community role that these buildings once had, as well as protecting and restoring their architecture. Out of this comes the ArChWay Project in Lincolnshire, which is an art project to put glassworks, poems and films on display in 14 churches during summer 2012. 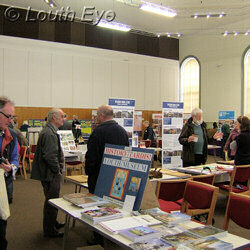 The festival had a good mixture of historical information and commercial activity, with plenty of books on sale. It was gratifying to see just how many opportunities there are to get involved with our history, whether it's to learn more about it or to keep it up for future generations to enjoy. The town council debates speed limits and playground provision, and demonstrates the value it places on local heritage. Lincoln Castle is a good place to visit if you have children to entertain. This imposing 15th century red-brick castle is well worth visiting.